Hi everyone! Today is the last day of the My Favorite Things September release countdown. This release is absolutely fabulous! The new products will officially be available on the MFT online store in a few hours!!! Yay!!! The new products will officially be available on the MFT online store on September 6th at 10pm EST (= Europe: September 7th at 4:00 CET). I immediately loved this scarecrow and had to use it! I decided to color him with non-traditional "scarecrow" color. I chose a blue-brown-white combo. I colored the scarecrow with Copic markers and added some "jeans texture". 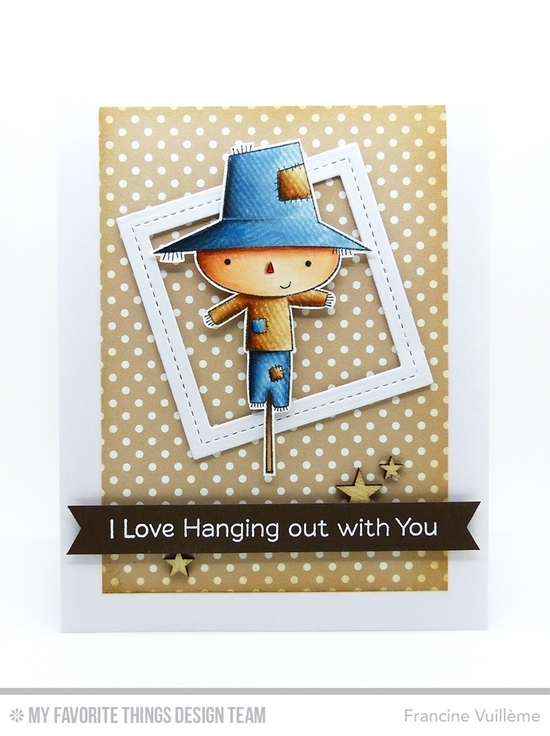 The patterned paper in the background is from the Dots & Stripes Neutral paper pack. I lightly sponged the edges with Distress ink. The frame is from the newest Die-namics Single Stitch Line Square Frames. I heat embossed the sentiment from the Fall Friends set with white embossing powder on Chocolate Brown cardstock. Great job showing off the wonderful scarecrow- he's framed! Absolutely adorable. Love the cute scarecrow and the lovely sentiment! Francine, your choices in Earth tone colors for this scarecrow/harvest card are perfect! So great for an Autumn card! So CUTE, Francine! I love how you added the jean texture and your scene is so fun!